LATEST ULTRSONIC TECHNOLOGY WITH UPGRADED CHIP -- The product will keep them away from your home once and for all. It is a rather humane way to solve pest problems by repelling than killing. Adopting the latest ultrasonic chip, the Renfox ultrasonic pest repeller repels mouse，rats, flies, mosquitoes, spiders, fleas, cockroaches, ants by affecting their auditory and nervous system to make them uncomfortable. SAFE FOR HUMAN body & PETS-The ultrasonic mosquitoes repellent repels pest totally depending on physical way. It constantly emits ultrasonic waves, making pests feel uncomfortable and flee your home. Compared with the traditional pesticide, this ultrasonic pest repeller is much safer with its features of non-toxic, odorless and harmless to human and pets (except for the pets like hamster). LUMINOUS BREATHING LAMP & MULTIPLE USAGE SCENARIOUS -- The mouse repellent can be used in many places, such as house, store, warehouse, garage, restaurant. The maximum coverage of this ultrasonic pest repeller is up to 1000 （10*10*10）sq. ft. One pest repellent for per normal size room is recommended for a best result. Luminous breathing lamp can make your home have light in the dark. 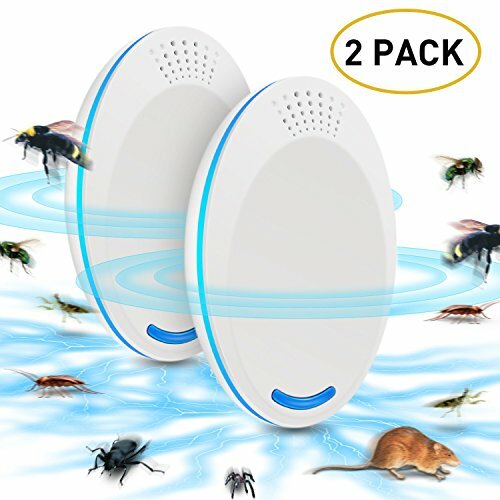 3 months-DAYS MONEY BACK & 100% SATISFACTION GUARANTEE --- If you have any questions or dissatisfaction to this ultrasonic pest repellent, please feel free to contact us for a replacement or refund within 3 months. We shall provide you with a satisfactory reply within 24 hours. Warm Note: A satisfying results can be received after using 2 weeks to 4 weeks. During this period, if you have any questions about the ultrasonic pest repeller, please feel free to contact us.